This Carbon Fiber Drop Point Folder from John Kubasek is a deceitful knife if you don't know what to expect, and no one ever does. 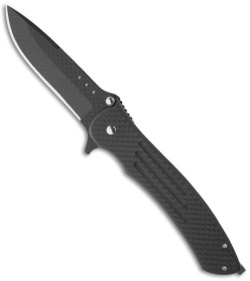 Aside from the D2 steel blade laminate, titanium clip and stainless hardware, it is all carbon fiber. So it's super lightweight, especially when considering its size. The blade opens with ease using the flipper and locks tight with the liner lock tab. 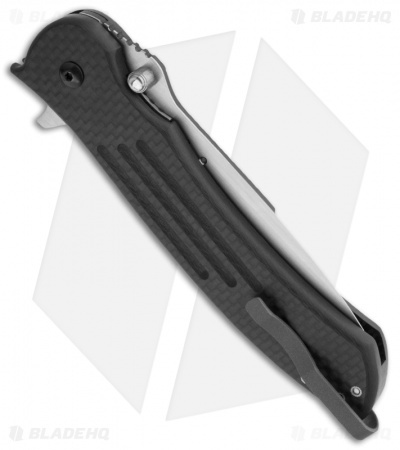 The handle is made from 0.20" thick carbon fiber slabs and outfitted with a titanium pocket clip.